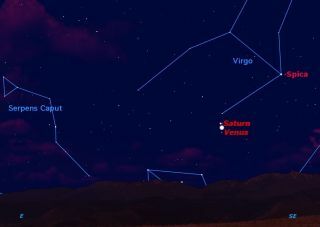 Look in the eastern sky just before sunrise this week for a close encounter between planets Saturn and Venus. They will be closest on Tuesday November 27 when they will fit together in a low-power telescope field. You’ve no doubt heard of the phrase, "like two ships that pass in the night." Well, come early Tuesday morning (Nov. 27), you’ll be able to watch two planets that will pass each other in the dawn. The planets in question are Venus and Saturn. One planet will be slowly descending into eventual obscurity, while the other will become increasingly prominent in the days and weeks to come. After Tuesday morning's rendezvous, which is known as a conjunction, the two planets will slowly go their separate ways. Venus, which was so prominent during the summertime, is now rising later and appearing lower to the horizon in the dawn twilight. It has about another two months to go before it ultimately drops down into the bright morning twilight and disappears from our view, eventually transitioning into the evening sky by early next spring. Saturn, on the other hand, will climb progressively higher and rise earlier, eventually becoming a prominent and well-placed evening object by the middle of spring. Why then does Saturn appear so much duller than Venus if both are reflecting the same proportion of sunlight back toward the Earth? The key is their distances from the sun. Compared to Venus, Saturn is 13.59 times farther away from the sun. And if we use the inverse square law — which states that the intensity of reflected sunlight is inversely proportional to the square of the distance from the sun — then 13.59 multiplied by 13.59 shows that sunlight striking Saturn’s cloud tops, is 184.69 times weaker compared to sunlight striking the cloud tops of Venus. In any case, arise early on Tuesday and take a peek as the Venus, the Goddess of Beauty, snuggles up to Saturn, the God of Time. Joe Rao serves as an instructor and guest lecturer at New York's Hayden Planetarium. He writes about astronomy for The New York Times and other publications, and is also an on-camera meteorologist for News 12 Westchester, New York. Follow SPACE.com on Twitter @Spacedotcom, Facebook & Google+.